← We’re up for an award! 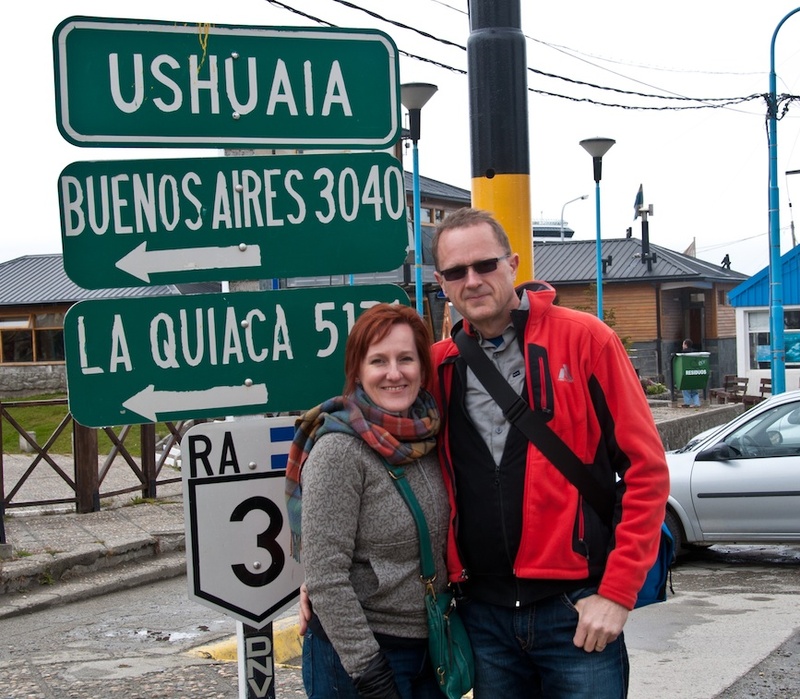 Christmas Day, one year ago, we were in Ushuaia, Argentina, on a cruise. We were still deliberating whether or not to move to Australia. If there would have been a sign there saying Wagga Wagga 10000 miles, it would have been an easy decision! So, what did we do on our first real southern hemisphere Christmas (we say real because last year we were in Ushuaia, Argentina but that was a novelty…a vacation, not how we live)? Well, on Christmas Eve we had dinner on the al fresco (Aussie for patio) and went for a walk around the neighbourhood looking at all the beautifully-blooming trees. There are some red gum trees with spectacular flowers right now. Then to bed fairly early, with plans of being up around 6:30am to go cycling. When you’re used to snow and ice, the idea of cycling on Christmas morning is quite magical; even Santa couldn’t compete with this plan! However, the first bit of consciousness on the 25th was earlier than planned as a huge thunderstorm went through Wagga just after midnight. Winds up to 85 km, a lot of rain, and thunder and lightning kept all of us – especially the cats – up. And we wondered, at the time, how it would be in the morning. Would the trails be flooded? Would the muck keep Santa’s sleigh (rather, our bikes) from being roadworthy by Christmas morn? 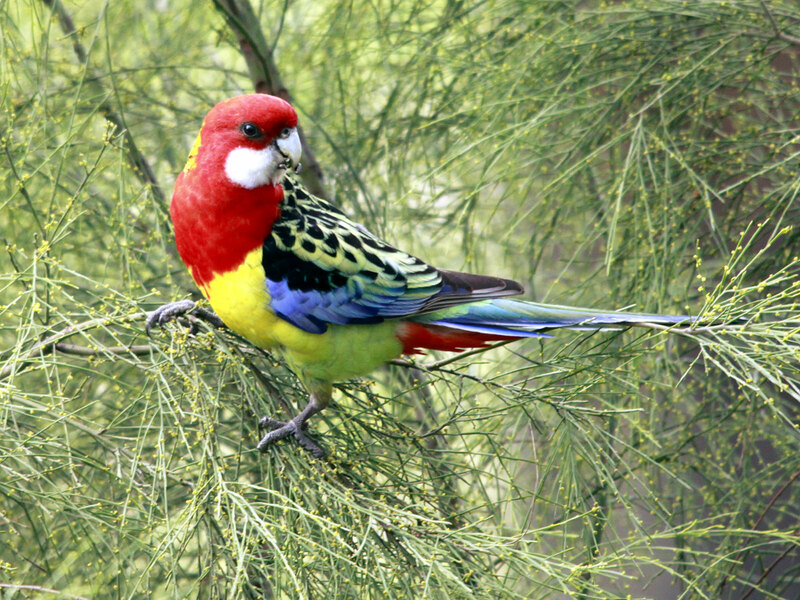 It is really hard to photograph birds while biking, so we stole this pic of an Eastern Rosella from another website. We saw scores of these and blue-winged parrots on Christmas morning. And herons, egrets, spoonbills, swans, ducks...Much better than whatever bird life is around Edmonton this time of year! Fortunately, it was fine. Better than fine, actually. At 6:15am it was 19 c and not a cloud in the sky! So we saddled up (as in put on the padded bike shorts) and went for an hour-long pedal east of the city. Because it was a holiday, we knew there wouldn’t be much traffic so we traveled on roads instead of trails. An amazing morning; probably 8 cars, in total (including two guys who we saw putting a BBQ in the back of their ute in an industrial area; Dan was sure it was their workplace and that they were surprising someone with a new barbie for Chrissie — but Lisa was sure they were stealing it, a la the Grinch – you know, the original 1966 cartoon version, not the horrible 2000 Jim Carrey version). Overall, it was a great route, and there was one segment of about 3 km where we saw more than 100 parrots! What a gorgeous way to start a day. Is this a) a really good restaurant? b) a really good winery? c) 15 km from our house? or d) all of the above and why we like Wagga? Answer: D. Yes, we like Wagga. When we got home, we had a Skype chat with Dan’s family (strange – they could see us but we couldn’t see them! Please Santa, won’t you bring the new IPad to Dan’s sister for Chrissie next year?). 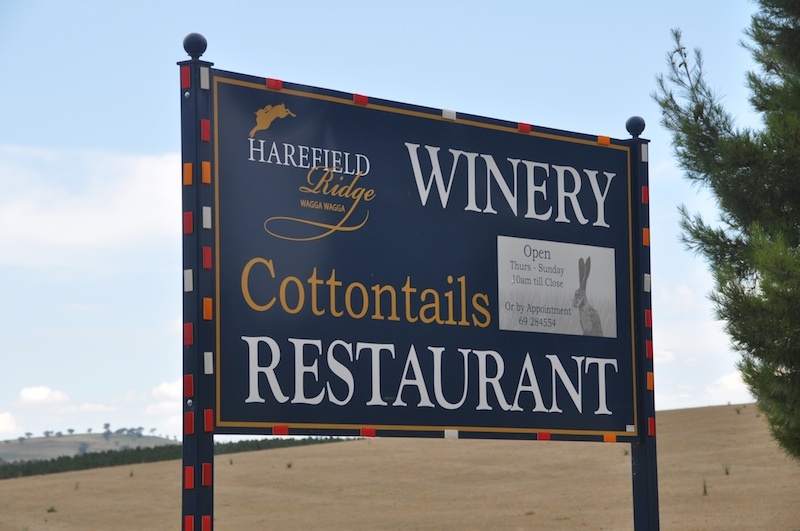 Then, we just relaxed for awhile before heading off for Xmas lunch at Cottontails on the Ridge, a local winery. Sure, that might seem like we were celebrating the day, but really it was just a good excuse for us to try this restaurant. And it was very good. Beautiful views of the vineyards and some great people-watching of the other folks who choose to eat out for Chrissie lunch (and no, we were not the only table for two in the place; however, the others included a 40ish guy treating his deaf mother and a very sour-faced couple, who arrived 90-minutes late — she looked pissed, while he kept going to the bar to get pissed… funny that!). Dan finally got to try yabbies, a local delicacy. A yabbie is a fresh-water prawn that lives in dams (aka small lakes) on the farm paddocks around town. We’ve even met someone who has them on their property. 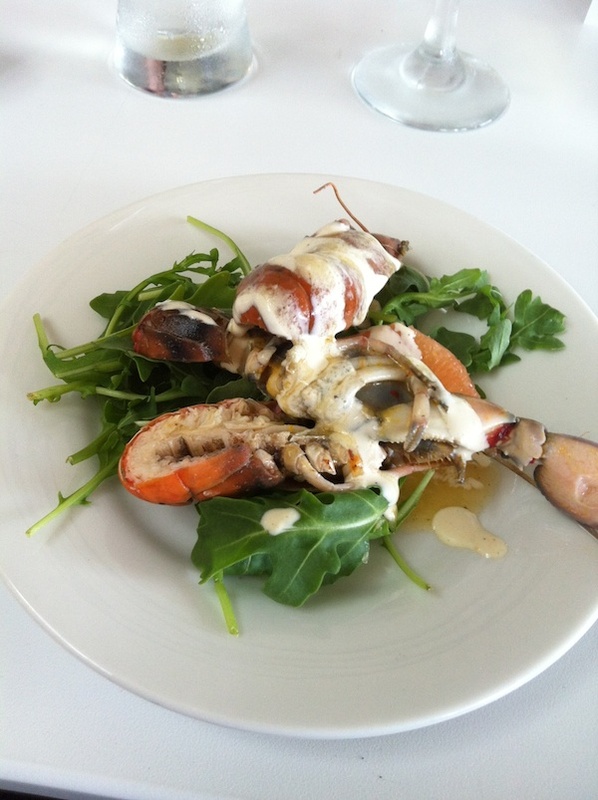 Dan says the yabbie salad was quite enjoyable, despite not knowing how to pick the meat out of the shell. Lisa enjoyed a spicy mango chicken salad (yes, fresh mango! Did we mention that we eat fresh – really fresh – mango almost every day!). Topped off by traditional turkey and ham dinners and then the (Aussie) traditional pavlova and Christmas pudding for dessert. Yum! We even had Christmas crackers with the silly hats and bad jokes… but the Aussies call them “bon bons”, which makes no sense at all! As Dan mentioned later that day, this would be very confusing to anyone who watched Married with Children on a regular basis. Christmas lunch ended at just the right time… both because our bellies were full (nap needed!) and because some very dark and ominous clouds were rolling into Wagga. While Dan bought some wine, Lisa monitored the lightning bolts and tried to estimate the distance from the restaurant to the car in her satin pumps. Yes, it wouldn’t be Christmas without dressing up! Dan wore his Hugo Boss suit (first time in over a week wearing long pants, and maybe last time for a few more) and Lisa wore a new slinky number that she bought in Canberra… which was balanced quite nicely by the bogans in jeans, sneakers and yes, sadly, thongs… eating lunch at the winery. That’s the Aussie version of the thong… thankfully (ick – bad mental image)! We did see a lovely tattoo of a large bird on one woman’s back! But still, we thought it would be a shame to ruin good dress-up clothes with a vicious rainstorm. The view from Cottontails. It was getting more and more ominous as lunch progressed. Luckily, we made it home just as the clouds opened up and after navigating through a patch of hairy panic (go ahead – Google it; you know you want to…) attacking the car in the ensuing wind storm. We were also just in time to Skype with Lisa’s family before they headed to bed (Christmas Eve, Canada time). We ended the day with a light supper of Cottontails wine, and local cheeses, charcuterie, and olives. Borrowing a page from the Test Cricket playbook, we decided to break for tea (well, actually lemonade) mid-afternoon during our bocce game. Unlike cricket, however, this game doesn't last 5 days. We also monitored the paper closely for notices of what would be open when — especially because December 27th was a holiday “in lieu” because the 25th fell on a Sunday. So, on the 27th, only the major department stores and grocery stores would be open. Imagine that! 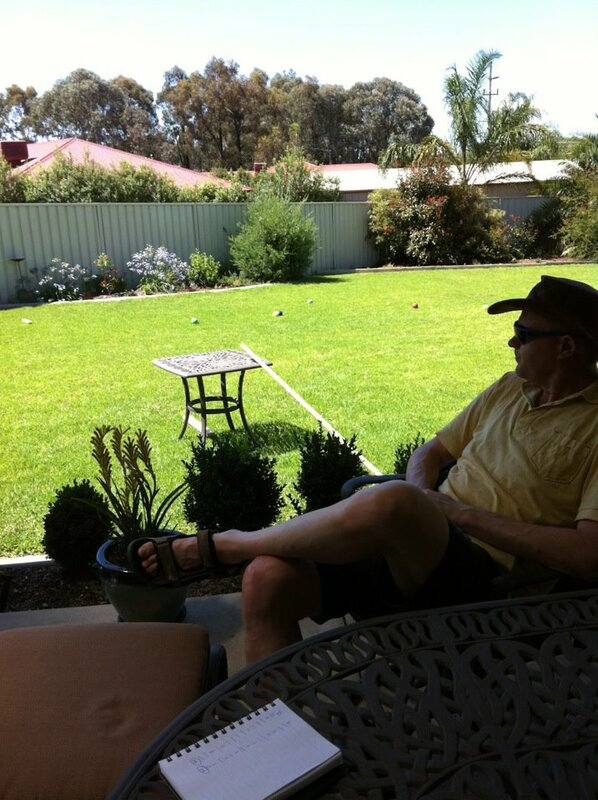 We did venture out on this pseudo-boxing-day, to buy a set of Bocce balls to play with in our expansive back yard. And a salad bowl (good sale at Myer! ), because we realized one day recently that somehow in our pre-move purge we got rid of all our nice ones! And a sports bra (for Lisa, not Dan; just to be clear). Happily, the paper also provided the Snakeman’s mobile number… so we knew we were covered for whatever this crazy holiday period might send our way. 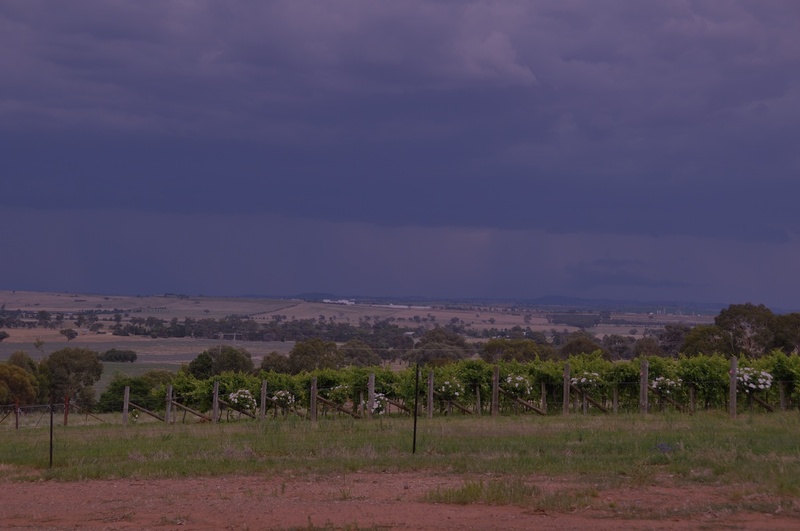 Next up, another holiday we aren’t celebrating, by going to the King Valley (another great wine region) for new years. This entry was posted in bicycles, birds, bogans, Christmas, food, hairy panic, holidays, wine, wineries. Bookmark the permalink. We use patio here, or pergola, or more often verandah (whether or not it’s actually a verandah, your undercover concreted space out the back counts). Alfresco here is the same as the rest of the world, just eating outside. It’s not a ‘thing’. Glad you got a proper Australian Christmas experience for your first one, it’s either stupidly hot (40+), or storms. Thanks Elizabeth. In the wagga paper, all the real estate ads call it an al fresco… as in ‘pool, covered al fresco, double lock up garage, ‘. Not sure if we’ve actually heard it referred to that way by people though. Verandahs, in Canada, are generally at the front of the house. Pergolas would be the structure covering the patio. The storms that ripped through here were pretty bad, caused some flooding in town and knocked down some trees. But then again, this soil seems to not be conducive to absorbing rain so it all just sits, and the gum trees like to self-destruct! That’s weird about the newspaper, unless they are trying to upsell properties and abbreviating it. Or just completely failing at grammar! There were some trees over the road between Corowa and Wagga (my inlaws travelled that way on Christmas day), but no damage here thank goodness. Glad to see & read that you had a wonderful Christmas! I am jealous of your parrot viewing adventures. It does sound a bit like paradise where you are. Cheers & best wishes towards your new year!